NTC Thermistor Inrush Current Limiters are used to reduce the inrush current that occurs when an electrical device is switched on. High inrush current is the result of the maximum instantaneous input current drawn by electrical equipment during the initial power up. As technology continues to advance, most systems today run efficiently and maintain a low impedance, which in turn contributes to a high inrush current. Keeping all of this in mind, the typical cool-down time needed is roughly between 30 seconds to 120 seconds. Besides the inrush current, there is another factor that needs to be considered for the cool-down time of the NTC thermistor inrush current limiters. In some systems where the inrush current limiter is not shorted after inrush current is over you need to take into consideration the self-heating effect (even when the inrush current limiter is not limiting current, it still has a steady-state current flowing through its system). This being one reason reset time, how long the system will need to be switched off in a given time frame to have a proper cool-down time, is crucial for the inrush current limiter to regain its initial resistance. 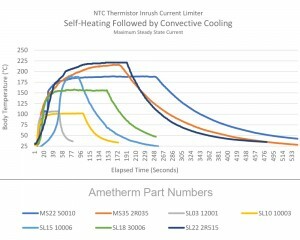 The chart below shows a sampling of Ametherm’s NTC thermistor inrush current limiters during both self-heating and convective cooling period. Demonstrating the amount of time it took, in this particular test, to cool back down to the ambient temperature after handling an inrush current. The cool-down time starting at the peak of the slope and ending at the bottom of the slope. For example, for the SL18 30006, the cool-down time begins at 153s and ends at 248s, showing a total cool-down time of 95s. Taking all of this cool-down information into consideration, one thing that is imperative for you to know is the reset time of your system. As shown in the chart above, cool-down time can vary between NTC thermistor inrush current limiters. When considering the reset time, if it is longer than your project will allow, there is a workaround. A time delay circuit, consisting of a relay and timer, can be employed to take the inrush current limiter out of the circuit as soon as the inrush current has passed through, allowing the inrush current limiter to begin to cool down much sooner. A great example of how this is done can be found at instructables.com, showing how to create this time delay when the inrush current limiter needs a little rest. While looking into what type of NTC thermistor inrush current limiter you are going to need, keeping the reset time in mind can be critical for the thermal functioning of your system. 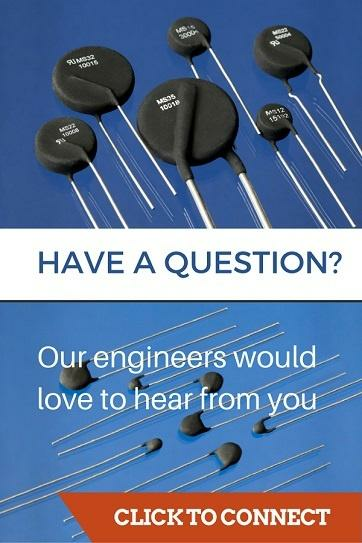 Ametherm has a wide range of NTC thermistor inrush current limiters constructed of a specially formulated metal oxide ceramic material that is sintered at an extremely high-temperature. 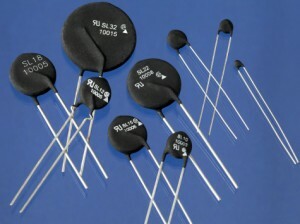 From our NTC thermistor inrush current limiter series of AS thermistors, having an exceedingly fast reset time, to the UL certified SL12 10006, with its compact size resets rapidly, and our MS35 20010 mentioned in the instuctables.com article, there are plenty of inrush current limiting options you can choose to fit any project needs. All of Ametherm’s NTC thermistor inrush current limiters are optimized for a variety of applications that require inrush current limiting to reduce component failure including switching power supplies, AC motors, motor drives, audio amplifiers, and battery chargers. Being especially useful in power supplies where the low impedance of the charging capacitor exposes the diode bridge rectifier to an excessively high current surge at turn-on. All of Ametherm’s inrush current limiters are both RoHS-2 and REACH compliant. Now that you know more about the importance of cool-down time when using an inrush current limiter check out a couple more helpful articles we have and learn more about stopping inrush current and how to determine the reliability of a thermistor. If you have any questions, do not hesitate to reach out to one of Ametherm’s engineers who are here to help you, or if you are ready for a free sample just ask.